Looking to find the value of the attached lithograph, who would I contact? 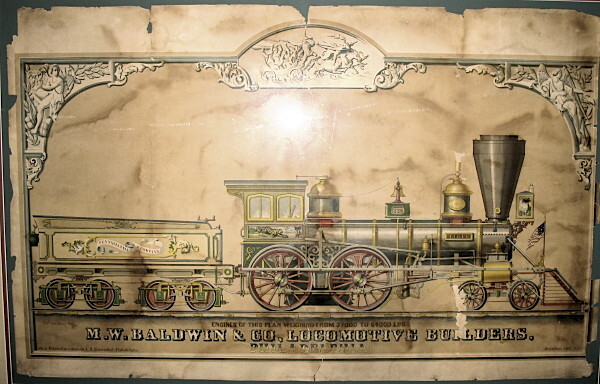 Your print appears to be an original advertising lithograph for the Baldwin Locomotive Works of Philadelphia. Advertising lithographs were commonly used by locomotive builders from the 1840s to the 1860s, showing the various types of machines built by the company. Your print shows a Baldwin passenger locomotive built in 1856 for the Pennsylvania Railroad, named Tiger. It represents Baldwin's design for fast passenger locomotives and helps date the print to 1856 or just after. Your print has several condition issues which will affect its value, such as fading, foxing, loss of edges and stains. The CPRR Discussion Group cannot advise you of value but you might consider contacting The Old Print Shop in New York for recommendations.